Grease pans and cooking sheets with butter. The easiest method is to melt butter (don’t burn it! ), use a basting brush to grease pans. In a large mixing bowl combine the dry mix; 2 cups of flour and the yeast. In a sauce pan, heat milk, salt, sugar and butter until warm (115-120°), stirring constantly to melt butter. Again don’t over heat or boil the mix. Break eggs into a cup or small bowl to combine yoke and egg white. Add mixed eggs to the dry mix, and beat at low-speed for about 30 seconds to combine ingredients. Scrap sides of bowl constantly. Once the flour has been moistened, beat for 3 minutes on high-speed. By hand, stir in enough remaining flour to make a moderately stiff dough. Place a 100% cotton sheet over the table or counter surface. Lightly flour the sheet; make sure it’s covered. Knead the dough by hand until smooth and elastic (takes approx. 5 to 6 minutes). Shape dough into a large ball. Place dough in a large lightly greased bowl; like a large mixing bowl. Turn the ball once to grease the entire dough surface. If you have an under the counter microwave (with a surface light) and if it’s large enough to accommodate the mixing bowl AND still leaves room for the ball to rise, you might consider putting it in the microwave with the surface light turned on. It will keep the area warm and help the ball rise. After the ball has risen, punch dough down in the middle and turn out the dough onto a floured surface/sheet. Cover with dry towel and let the dough rest for 10 minutes. Shape dough into rolls and place on a lightly greased cookie sheet. (see shaping instructions below). Cover and let rise in a warm place until rolls have doubled in size. (approx. 30 to 40 minutes). Melt 1 tblspn butter (not margarine). 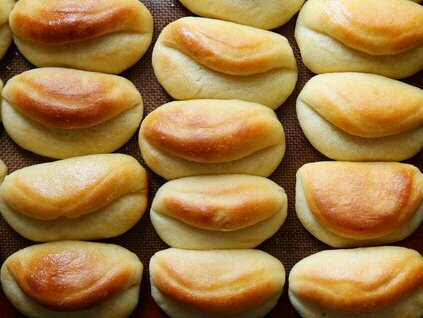 Carefully brush the tops of the rolls with melted butter. Gary says to bake the rolls at 375° until brown (approx. 10 to 12 minutes)*. 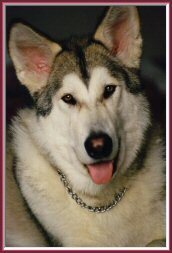 * If the dough doesn’t rise after 1½ hours, something went wrong and it may not rise at all. It could be the yeast you used wasn’t fresh enough and may have died during the process. Go ahead and make the rolls as normal. No need to waste the dough. They’ll simply be thick and heavy instead of the desired light and fluffy. For all these shapes, you’ll roll out the dough and cut the rolls into shape. You’ll have left over dough as a result. Combine all the left over dough and form it into another ball to roll it out on a floured surface/sheet. Then cut more rolls. Eventually, you’ll end up with a small leftover ball that you won’t be able to form into another shape. Just roll that piece into a ball and place it on the side of your cookie sheet for baking. 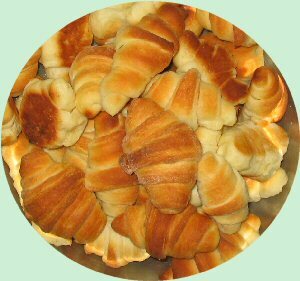 I always think of these as mini-croissants. But croissant dough is significantly different. Still they’re a lot of fun to eat. At least that’s what the kids think. 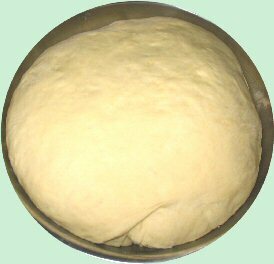 On a lightly floured cotton sheet, divide dough roll into 3 equal pieces and round each into a ball. Roll each ball into a 12-inch circle about ½ inch thick, with a floured rolling-pin. To shape rolls, begin at the wide end of the wedge and roll toward the point. Place the edge of the point down on a lightly greased cookie sheet. Gently turn the edges of the roll in toward the center of the roll to give it a curved shape. Place rolls 2 to 3 inches apart. Repeat this step with each of the separated balls of dough. Brush butter on the tops of each roll, then bake using the instructions above..
Maw Carey told me to make Parkerhouse rolls, you place the folded roll on its side, so the split faces to the side. Brush the top with butter and then bake. Folded rolls are placed on their back, so the split faces up and can hold the dab of butter after they’re brushed and then baked. In both cases, the rolls are placed close to each other on the sheet, so they help hold each other’s shape as they rise in the oven. Roll each ball into a 12-inch circle about 1 inch thick, with a rolling-pin. Using a juice glass, or large cookie cutter, cut the dough into circles. Remove each round roll from sheet and light coat with melted butter. Place roll (fold on the side) on a lightly greased cookie sheet. Using your finger, gently press a line dividing the roll in half. Fold one half over on top of the other. Place on the greased cookie sheet. My favorite shaped rolls on Maw Carey’s dinner table. On the lightly flowered sheet/surface, roll out the dough flat, about 1 inch thick. Cut dough into 2 inch squares and roll each square into a ball. Place 3 balls into a greased cupcake baking pan. Make sure they form a clover inside the cupcake space. Cover with a clean towel and place the pan in a warm space to let the balls rise for about 60 to 90 minutes. The rolls should rise up over the pan surface. 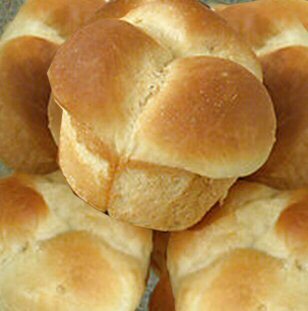 Once risen, brush the tops of the rolls with melted butter and bake.